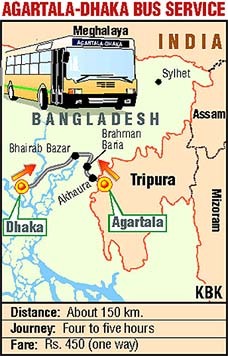 The much-awaited bus service between Dhaka and Agartala was formally inaugurated here today in the presence of ministers of both India and Bangladesh. The Nepalese police today arrested a 59-year-old man, internationally known as the ‘’Serpent’’, for the murders of a Canadian and an American here 28 years ago, the Kantipur FM Radio reported. Pakistan has said it will oppose India’s bid to secure permanent membership of the UN Security Council on the ground that there is no need for expansion to create “new centres of privilege”. Pakistan has denied visas to a 40-member delegation of Indian theatre artistes, close on the heels of a group of top Indian jurists meeting with the same fate. A Federal judge has given an Oklahama based company a deadline till October 31 to submit concluding arguments on whether it denied minimum wages to 52 Indian workers employed by it. As the UN Security Council faced sharp division on Iraq and West Asia, Prime Minister Atal Bihari Vajpayee today left for New York to address the UN General Assembly, expressing full support for Palestinian leader Yasser Arafat and seeking clarity from the world body on troop deployment in the war-ravaged Arab nation. There are about 10 Indians, mostly from Punjab, languishing in Turkish jails — all of them illegal immigrants arrested while attempting to pass through Turkish territory to the greener pastures of western Europe. The eye of Hurricane Isabel roared across the US East Coast today, ripping roofs of buildings, cutting power to hundreds of thousands of homes and bringing Washington to a standstill. 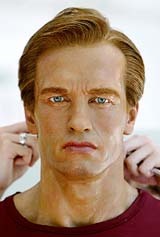 The wax figure of Hollywood actor Arnold Schwarzenegger is on display at a charity event in Hong Kong on Friday. Schwarzenegger is gubernatorial candidate for the US state of California. 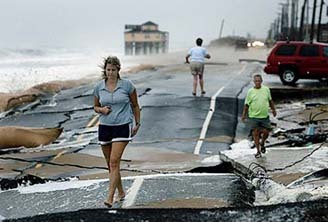 Beachfront resident Kathy Dewey walks over a buckled highway on her way to inspect damages to her home after Hurricane Isabel ploughed through Kitty Hawk on the outer banks of North Carolina on Thursday. Three US soldiers were killed and two wounded late yesterday in an ambush near the hometown of ousted Iraqi leader Saddam Hussein, a military spokesman said today. A Buddhist priest, dubbed the marathon monk, has completed an ancient running ritual in the remote Japanese mountains that took seven years. Pakistan President Gen Pervez Musharraf has become a grandfather after his daughter-in-law delivered a son in a private hospital. Indian Minister for Road Transport and Highways B.C. Khanduri and Bangladesh Communication Minister Barrister Nazmul Huda formally opened the bus service following a decision of the India-Bangladesh Joint Economic Commission. Bangladesh Foreign Minister M. Morshed Khan and Tripura Chief Minister Manik Sarkar were also present on the occasion. This is the second bus service between the two neighbours after commissioning of first Dhaka-Kolkata bus service on July 9, 1999. Two decorated buses carrying Ministers, politicians, journalists, artists and high officials of the two countries left for Agartala at 10.10 am for the inaugural ceremony in India. The ‘’Sarak Bhavan’’ in the Capital this morning termed the bus service as a historic moment and said it would further strengthen relations between the two countries and encourage development, trade and tourism. Mr Khanduri said economic and commercial relations between India and Bangladesh had flourished significantly during the last decade. Despite overall progress, substantial trade and investment opportunities remain untapped. Identified as Charles Sobhraj, the suspect, during a 1975 visit to Nepal, allegedly murdered Canadian Laddie du Parr and American Annabella Tremont and burnt their bodies. He fled the country after the charred bodies of the two victims were found in the outskirts of the Nepalese capital. The police said Sobhraj was arrested at a casino in a Kathmandu five-star hotel early this morning and was likely to be produced before court on Monday. Sobhraj, Vietnamese-Indian by birth and a French national, was reported to have entered Nepal two weeks ago and spent most of the time in five casinos in the Kathmandu Valley. According to the ‘’Himalayan Times’’ which first broke the story about Sobhraj’s presence in Nepal two days ago, he is alleged to have killed unsuspecting tourists in Nepal, Thailand and India. He was released from Tihar Jail in India in February, 1997, after serving a jail term and was reported to have moved to Paris. “We do not support expansion of the permanent membership of the Security Council. No new centres of privilege should be created in the UNSC,” Pakistan’s Foreign Office spokesman, Masood Khan has been quoted as saying by the ‘Dawn’ daily. Reacting to the UN proposal to expand the Security Council beyond the size of its five permanent members, Masood Khan said Pakistan wants the expansion of the representation of the non-permanent members in the UN, specially from the developing countries but not the permanent membership. “The Security Council can be expanded in the non-permanent category to make it more representative and democratic. Such a step will give the developing countries a great say in the decision-making process of the council,” he added. The artistes were invited to take part in next month’s World Performing Arts Festival in Lahore. According to sources, repeated attempts by the event organisers Rafi Peer Theatre Workshop, who have written to the Pakistan High Commission in New Delhi to permit the group to visit Lahore, have not yielded any results. Early this month a high-level delegation of serving and retired judges from India, which was invited to visit Pakistan by its Supreme Court Bar Association were denied visas, much to the embarrassment of the Pakistan legal community. The association officials allege that the visas were denied to Indian jurists in view of its own agitation against the judges and the government. The skilled Indian workers, including welders, fitters and electricians, have also complained that they were confined in the factory premises of John Pickle Company and given substandard food. The company though has said they were temporary trainees destined for its plant in Kuwait. If the court decides that they were full time employees, then the issue about their alleged denial of minimum wages would be taken up. The defence rested the case yesterday after producing only two witnesses and the judge gave the two parties till October 31 to submit their concluding arguments. John Pickle Company, which manufactured specialised oil equipment, has since shut its doors, citing bad publicity generated by the case. The workers allege that they were given two or three dollars an hour in 2001, much lower than the federal minimum wage of five dollars and fifteen cents. “They can easily be given a place to live, little bit of food, they might not know what they were missing and that’s exactly what happened to the folks coming from India,” worker’s attorney Robert Canino said. The company had been using an Indian agency to recruit workers and after six months they were either sent to Kuwait or returned to India. As the UN Security Council faced sharp division on Iraq and West Asia, Prime Minister Atal Bihari Vajpayee today left for New York to address the UN General Assembly (UNGA), expressing full support for Palestinian leader Yasser Arafat and seeking clarity from the world body on troop deployment in the war-ravaged Arab nation. Issues of terrorism, developments in Iraq and the West Asia situation are likely to dominate the Prime Minister’s address to UNGA on September 25 and his talks with US President George W. Bush possibly on September 23. During his week-long stay in New York, Mr Vajpayee is also expected to meet Russian President Vladimir Putin and other world leaders on the sidelines of the UNGA to discuss international, regional and bilateral issues. 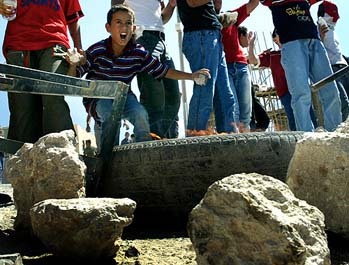 On the West Asia situation, the Prime Minister has emphatically opposed any move by Israel to expel Mr Arafat, saying he is the elected leader of the Palestinians. In sharp contrast, Mr Bush today described Mr Arafat as a failed leader while acknowledging US-sponsored road map for West Asia was now stalled. In New York, a resolution demanding Israel to drop its threat to expel Mr Arafat from West Bank would be taken up by the UNGA. A similar resolution was vetoed by the USA when it came up before the Security Council last Tuesday. On Iraq, Mr Vajpayee, who is the first Indian Prime Minister to address the General Assembly for five consecutive times, has said there is no clarity as yet on further action on the issue by the Security Council. Indians, however, form a minuscule percentage of the total number of illegal aliens, who use Turkey — which strategically straddles Asia and Europe — to get across to the more prosperous west European nations, according to an official in the Indian Embassy here. An estimated 150,000 illegal aliens passed through Turkey to western Europe every year, the official said. Of these, some 5,000 to 6,000 were from India. Towns along the North Carolina and Virginia coasts were desolate and boarded up as the storm brought 165 km winds and started moving toward the US capital. Isabel headed up the Atlantic seaboard and a tropical storm warning had even been issued for New York by the National Hurricane Center. Nearly 4,00,000 homes in Virginia were without power, its Governor Mark Warner said, and electricity companies said tens of thousands more had been hit in North Carolina. Warner told CNN Television the blackouts could last “a few days”. In Elizabeth City, North Carolina city manager Tommy Combs said: “It’s going to get much worse as the winds pick up. Lines are knocked down by the wind and stuff like branches flying around,” he said. Flooding was immediately reported in parts of North Carolina and Fred Gentry told how the hurricane tore down his house in the beach resort of Kitty Hawk, despite his wall of wood and sand bags to keep out the waves. “The wall literally just split in half horizontally. It just caved in, taking the furniture with it. It just blew it up. It sounded like a bomb blowing off. “Debris came down the hallway, slammed the backdoor, trapping us in,” he said. Corporal Vernon O’Donnell said the soldiers of the US 4th Infantry Division were attacked, 8 km south of the central town of Tikrit. A Buddhist priest, dubbed the marathon monk, has completed an ancient running ritual in the remote Japanese mountains that took seven years and covered a distance equivalent to a trip round the globe, wearing only a flowing white robe and flimsy straw sandals. The 44-year-old monk, Genshin Fujinami, returned yesterday from his 1,000-day, 40,000-km spiritual journey in the Hiei mountains, a range of five peaks that rise above the ancient Capital of Kyoto, said an official at Enryakuji Hoshuin, guardian temple of the grueling tradition. Dressed in his handmade sandals and robe with a straw raincoat draped over his head, Fujinami was greeted at the end of his journey by a crowd of worshippers, who knelt to receive his blessings, said the official, who declined to give his name.